In 2004, the Angels gave the Cardinals the perfect Christmas gift, opting not to re-sign their shortstop, David Eckstein, making him a free agent. The Cardinals, desperate to replace shortstop Edgar Renteria, who had become a free agent and signed with the Red Sox, hardly could believe their good fortune. Eckstein was one player who filled two needs. He could replace Renteria at shortstop and he also could bat leadoff. Like Renteria, Tony Womack, who batted leadoff for the 2004 Cardinals, had become a free agent. Womack signed with the Yankees. Pouncing on the opportunity to acquire a player described by general manager Walt Jocketty as “a perfect fit,” the Cardinals signed Eckstein on Dec. 23, 2004, two days after he became available. It was a move they’d never regret, one that felt right from the moment it occurred. Eckstein ignited the Cardinals with his hustle, heart and smarts, leading them to two postseason appearances and a 2006 World Series championship. Though Eckstein had sparked the Angels to their only World Series title in 2002 and had led American League shortstops in fielding percentage in 2004, the Angels sought an upgrade, citing Eckstein’s lack of arm strength as a liability. Meanwhile, Renteria, a three-time all-star with the Cardinals, had bolted to the Red Sox, who gave him a four-year, $40 million contract. With Renteria joining Boston, Orlando Cabrera, the shortstop who helped the Red Sox sweep the Cardinals in the 2004 World Series, declared for free agency. The Angels pursued him, offering a four-year, $32 million deal. When Cabrera accepted, Eckstein became expendable. According to the Associated Press, the Cardinals, unable to find a suitable replacement for Renteria, were considering signing shortstop Barry Larkin, 40, who had become a free agent after 19 seasons with the Reds. When Eckstein became available, the Cardinals called with a three-year, $10.2 million offer. Eckstein, 29, accepted and it was a bargain for the Cardinals. Angels players and media were disappointed Eckstein departed. Eckstein, 5 feet 6, 170 pounds, had 156 hits in 142 games for the 2004 Angels. He seldom struck out (49 times in 637 plate appearances) and fielded effectively (six errors). In the 2002 World Series against the Giants, Eckstein batted .310 with nine hits, three walks and six runs scored for the Angels. Rex Hudler, an Angels broadcaster who had been a hustling utilityman for the Cardinals from 1990-92, told Miklasz he’d named his son, David, in honor of Eckstein. “He’s going to be revered as the new Huckleberry Finn of St. Louis and Missouri,” Hudler said of Eckstein. That’s exactly what Eckstein did for the Cardinals. 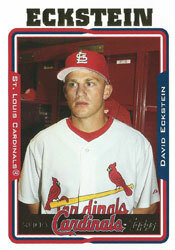 In three seasons (2005-07) as the St. Louis shortstop, Eckstein twice was named an all-star. He batted .297 with 465 hits in 398 career games for the Cardinals. He had a .357 on-base percentage with them. In 2005, Eckstein ranked second among National League shortstops in both assists (517) and double plays turned (123). His crowning achievement came in 2006 when he was named winner of the World Series Most Valuable Player Award. Eckstein hit .364 in the five-game series versus the Tigers, with four RBI and three runs scored.